ACM meeting: Thursday 5PM 11/17/2005 in Shaffer 300. Free food. About a week ago, I found out that I had been in the October 17th issue of the Legal Intelligencer, in an article based on my Law Journal TV appearance. When Law Journal TV asked me for photos to use in a press release, I sent them this photo that Fred Benenson, FC @ NYU co-founder and photographer extraordinaire, took of my panel at Yale’s RebLaw conference. I neglected to give poor Fred credit at the time, and so it appears that this photo has been printed in multiple places without his name next to it. My apologies! I’ve become convinced that Nelson’s hoodies are actually a form of exoskeleton, and that he would collapse in a pile of organs if he didn’t wear one. Attack of the mysterious juicer thing! Several days ago, Steven Bhardwaj showed up at my dorm with a strange object that he discovered at a flea market, which he felt compelled to give to me. It appears to be some sort of juicer, perhaps an orange juicer. If I had to hazard a guess at its operation, I think that you slice up an orange, place the slices in the hopper, and squeeze the juice into a cup placed under the funnel. This conclusion is strengthened by vaguely orange-colored stains on the base of the machine. Has anyone seen something like this before, who could confirm my theory? UPDATE: That is because I should have been searching for patent # D86217! The D is important, apparently. If you go there and click on “images” you should be able to see pictures of my gadget! 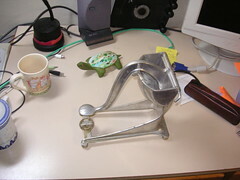 UPDATE: Other pictures of the object can be found in the Flickr set Mysterious juicer thing. At any rate, thanks for the juicer thingie Steve 🙂 It’s always nice when old friends stop by… I hadn’t talked to Steve in so long that I didn’t know he had gotten engaged! Unfortunately I can’t find the link now, but his proposal somehow made it onto Chinese TV, since he and his fiancee-to-be were in China at the time… intense. Apparently over in China, arranged marriages are still the norm, especially in rural areas, so an engagement is still something newsworthy, especially since foreigners are frequently newsworthy anyway, it seems.